Friends of one of the 5 relatives allegedly killed by a mom and daughter are speaking out. We're also hearing from the father of one of the victims who reveals new details about what may have led to the tragedy. The last time Destiny Harris saw her 9-year-old twin sisters, they were getting ready to celebrate their upcoming birthdays. A week later, their bodies were found inside a Bucks County, Pennsylvania, apartment. Two of the girls' relatives - their aunt, 45-year-old Shana Decree, and her 19-year-old daughter, Dominique Decree - are charged with the murders and those of three other relatives. 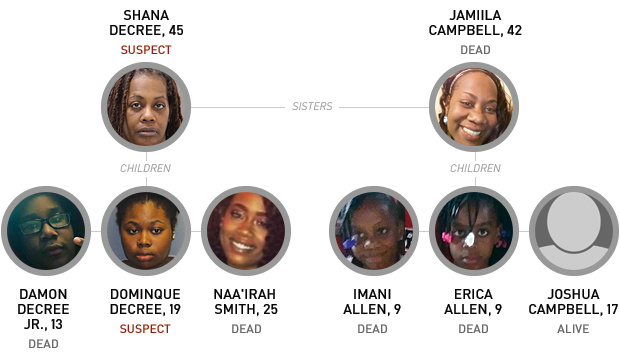 "They were so happy," Harris said of her sisters. "They didn't deserve that." 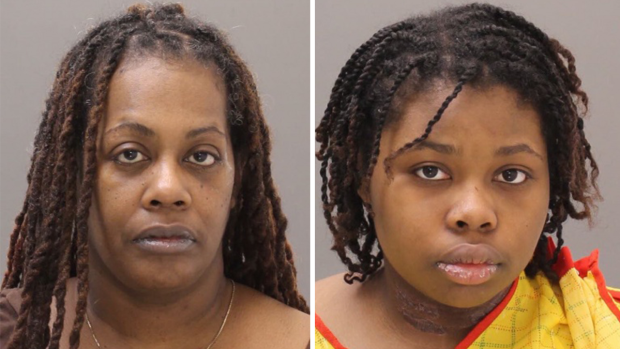 Both mother and daughter are being held without bail because of the potential for first-degree murder charges, Bucks County District Attorney Matthew Weintraub said. There are no additional suspects, officials said. Weintraub declined to elaborate on a motive for the five murders, but Shana Decree offered a haunting statement to police: They "wanted to die," she said of her relatives. Officials discovered the gruesome scene Monday afternoon in a small first-floor apartment located on the 200 block of West Bridge Street in Morrisville. The bodies were discovered by the building manager after a Bucks County Children and Youth Social Services Agency representative attempted to perform a well-being check on the family. Officers who later arrived on the scene found the apartment in "disarray" and bodies scattered throughout one bedroom. Broken glass and turned-over furniture littered the three-bedroom apartment, officials said. Some of the victims were lying in beds while others were sitting upright, according to the affidavit. One had his foot through the wall and into another bedroom. Police believe the killings happened at some point on Saturday, though they have yet to release causes of death. The victims were identified as Shana Decree's two children, Naa'Irah Smith, 25, and Damon Decree Jr., 13, both of Morrisville; Shana Decree's sister, Jamilla Campbell, 42, of Trenton, New Jersey; and Campbell's 9-year-old twin daughters, Imani and Erika Allen. The twins would have turned 10 years old this week. Smith, meanwhile, had only lived in the apartment for just one month and was engaged to be married, according to her father, Ronald Smith. Earlier in February, he tried to visit his daughter but she would only speak with him through the door. Then, Ronald Smith received text messages from his daughter saying that soon she would pass through the "pearly gates." "My daughter was a very good person," he said. "I don't know how she fell into this or what happened. I still want answers, too." Campbell's 17-year-old son, Joshua, who was initially feared to be in danger, was found safe with friends in New Jersey, police said. "Frankly, we're still trying to sort this out," Weintraub said. "The people who committed these atrocious acts are now in custody and [will] be made to pay for their crimes." Police say the suspects, Shana and Dominique Decree, were related to the five people they're accused of killing. 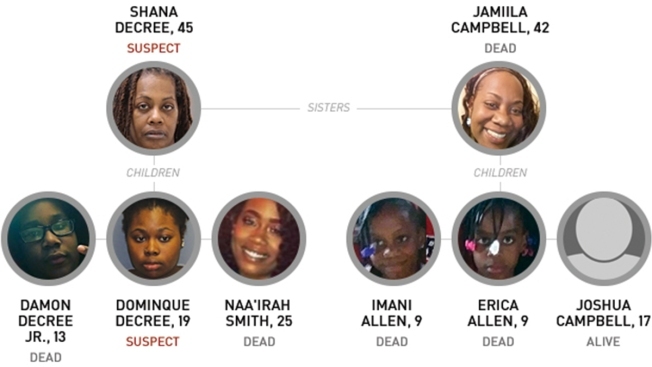 All eight family members lived in the same Morrisville, Pennsylvania, apartment. Neither Shana Decree nor her daughter had prior criminal records and nothing suspicious was discovered during the family's last well-being check, which was performed on Feb. 5, according to the county. But Destiny Harris said she had a bad feeling even before hearing the devastating news. The Decrees "were going through something religiously, and they decided to drag the kids into it," she said. "They never should have had to deal with any family issues." But Morrisville chief of police George McClay refuted a possible faith-based motive. "That has not been indicated in any way," he said. Neighbor Nicole Owens told NBC10 that she became concerned Friday when no one answered her knock at the family's apartment. On Saturday, Owens alerted apartment maintenance staff that something might be wrong. Two days later, a Bucks County representative attempted to do a well-being check. When no one answered, a building manager let himself inside. He found Shana and Dominique Decree "disoriented" in one of the bedrooms, according to the affidavit. They were both taken to a local hospital before their arrests, Weintraub said. When she reported to jail, Dominique Decree had visible injuries to her neck, officials said. 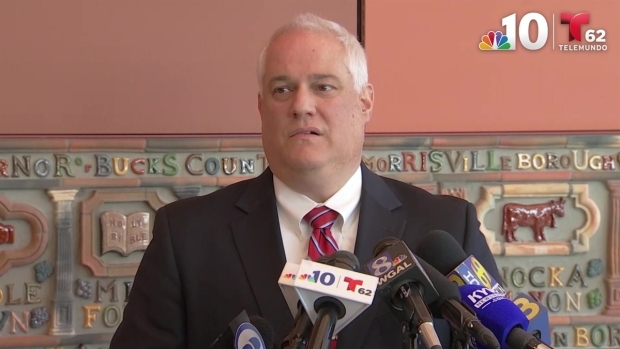 Bucks County District Attorney Matt Weintraub choked up while discussing the arrest of two women implicated in the killing of five family members — ranging in age from 9 to 42 years old. At the hospital, each woman initially claimed that a man or men killed their family members and attacked them, police said. Shana Decree later told investigators that the entire family "wanted to die." She claimed even the children were suicidal. At least one of the 9-year-old twins attended Morrisville Middle School, which released a statement Tuesday morning offering counseling and support services for students and staff. "This is a time of great sorrow for the entire school community," the statement read. "This is a difficult time for everyone, but I know our students and staff will be able to lean on each other as they remember their classmate." Online court records don't list an attorney who could comment for either woman. NBC10 journalists Deanna Durante, Miguel Martinez-Valle, Steven Fisher, Brandon Hudson, Mitch Blacher, Jim O'Donnell, Aaron Baskerville and David Chang contributed to this report.